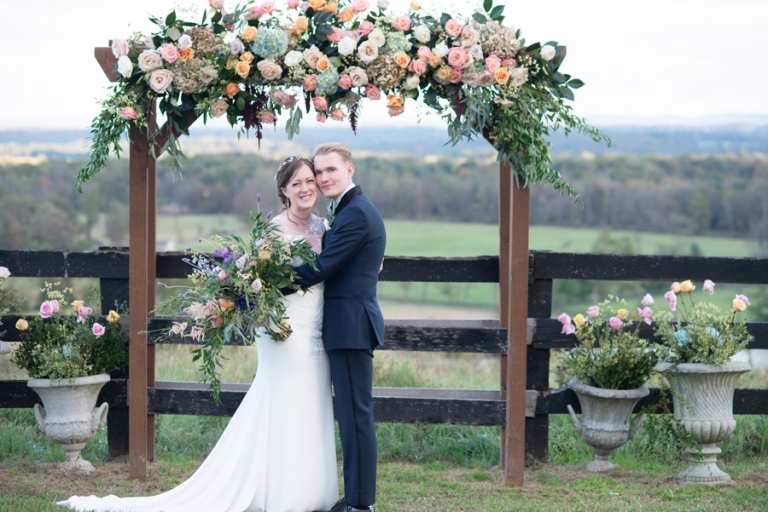 Patricia and Craig had the most beautiful Fall Wedding at Highholdborne Estate on October 13, 2018. As soon as I pulled up into the venue the clouds started to clear and the sun was shining. I never tire of the gorgeous mountain views at this venue.. just stunning! I always say it, but this is one of my all time favorite venues and I love coming back several times a year to capture beautiful weddings here. June, the owner is so sweet, and her and her daughter feel like family! Fall hadn’t quite made it’s appearance yet, and the views were still lush and green with hints of Fall on it’s way. As I entered the bridal suite, Patricia looked amazing with her birdcage veil and makeup and hair beautifully done. What a gorgeous bride she was! Craig looked just as handsome in his suit. I was excited for their first look, by the look on Craig’s face when he saw her I knew he thought she made a stunning bride as well! Patricia and Craig live in Seattle, and we were able to meet up this past Spring for their engagement session in D.C. I knew when I met them they were so easy going and fun and that they were going to have a beautiful wedding! Their day was so full of love filled with family and friends and they kept the dance floor hopping all night long! Darling Photobooths was there as well and the guests enjoyed posing for the fun photobooth in between dancing. I highly recommend them for a fun party! All the vendors did such a beautiful job from the gorgeous florals, to the food, to the music which made the day flow so seemlessly. Enjoy some of my favorites from the day. I know they are off enjoying their honeymoon in Paris as we speak. I love following my couples along on their adventures after their wedding. Part of me always feels like a piece of my heart is with my couples always. Wishing you two many happy years together! XO. Lately, I’ve been feeling like I need to share my personal story here. It’s easy to post a beautiful portrait, but often we don’t see the struggle or hurt behind a photo. I won’t forget the day my daughter told me she was expecting with tears in her eyes. I had actually dreamed she was pregnant two weeks earlier. In my dream she told me and showed me a photo of a positive pregnancy test, exactly how it happened that Spring day. I remember telling my husband. We both brushed it off as a crazy dream. Looking back I know God was preparing my heart. She didn’t think she could keep the baby. All she could feel was the fear. See, I had the same exact story twenty something years earlier with her. I was 21, scared, in a new relationship the same as she was. The father wanted me to have an abortion, he eventually decided he didn’t want to be a father. I knew in my heart I wanted to keep her. I knew I had to make the decision to do it on my own if I needed to. She was and always has been the best decision I made. Being a young mother made who I am today. Without the struggle I don’t think I would have had the strength within myself I have today. I needed to grow, and come to the end of myself. Sometimes I think God knows we are stubborn and need to take the hard road. He needs to teach us through our struggles that we need him. One thing I hope to teach my daughter through this is.. people will walk away, pray for them anyway. Wish healing for them. I so wished that my story was not her story. What I learned that God will never leave us. There is nothing we can do that is beyond his grace. In my perfect world for her there would be the perfect guy, and the amazing family. The truth is that we live in a broken world. She’s now a single mom doing it alone. She’s picking herself up and finding the strength within her. I’m so proud of her and her decision to keep her son. I thank God every day for this new baby. He will be so loved by all of us. He will be adored and bring our family joy. He will be taught to love the Lord. He will be taught to be a good man. I love how God takes our ashes and makes them beautiful again. God knows his name, he is created with a purpose. I also know one day she will have her own beautiful story to tell and the family she dreams of in God’s perfect timing. I am not alone, I am not alone, You will go before me. Seven weeks left.. we can’t wait to meet you Asher Grey! The Town of Seaside, Florida has the cutest beach shops.. and that Emerald Blue water! The Post Office is the cutest! We loved our beach condo at Promence on #30A, such nice amenities, loved the pool and the designer decor! Coffee and exploring with Stephanie Messick, isn’t she adorable?! So happy for her and her upcoming move to Florida! Seaside, Florida is one of my all time favorite getaways! I love the Gulf Coast of Florida with it’s Emerald Blue Water and Coastal Cottages. It really is a little hidden gem about 40 minutes from Destin. I loved my time here with family. We’ve been about 4 times now, and its the perfect place to just go and relax. I don’t get to see my siblings and mom as much as I would like, so it was wonderful playing with my niece and nephew and just soaking in some family time. We’ve had some hard unexpected family things come up recently and it just makes me think how we never know where life is going to take us, so cherish time with family and friends and be love to those around you. Don’t wait to spend time with the people you love. Aly’s Beach is one of my all time favorite spots to take a walk and just take in the beautiful architecture and of course take family pictures! It’s getting a bit stricter now to photograph here and the residents like their privacy, but it’s so worth the visit! I even got to meet up with one of my VA photographer friend, Stephanie Messick who was also in town and is moving here soon, lucky girl! Loved catching up over coffee at the Fontville Press and exploring Aly’s Beach with her. It was super hot and humid but we got in a few beach days, and some pool time. Other days were spent walking around my favorite little towns of Seaside, and Rosemary Beach, shopping and getting dinner out. I love grabbing a bite from the seaside food trucks and browsing the cute little shops. One day we visited the Spa at the Pearl, which was so relaxing. I recommend having a drink too on their rooftop terrace. It you have never been to 30 A you need to visit, It’s such a beautiful place to visit! So many wonderful memories made with family here.